Greg Bertish is a phenomenal man. I have known Greg as a patient for 7 years. In my opinion, Greg’s incredible recovery is due in-part to his physical and emotional strength, resilience, determination and fortitude, coupled with an enquiring and questioning mind. The remainder is due to his deep respect for and awareness of his state of health. Through his illness and recovery, Greg has developed an intuition of the true meaning of well-being and empathy for others who have experienced what he has. 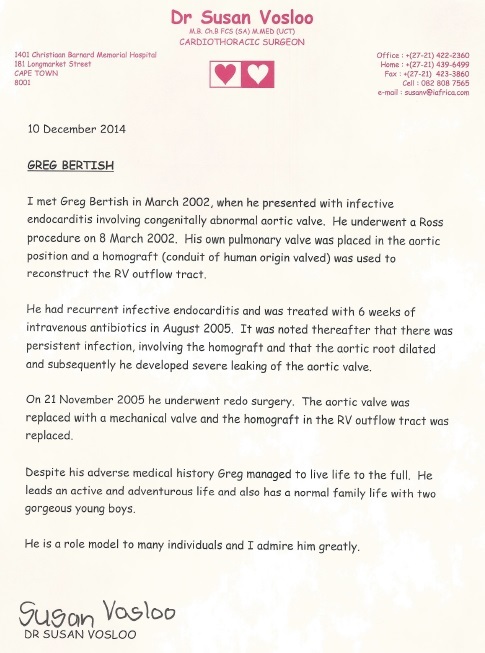 It is this respect and intuition that keeps Greg well and allows and motivates him to use his story and first-hand knowledge, to reach out and give back, through his fund-raising initiatives and association with the Heart and Stroke Foundation of South Africa, their Healthy Hearts Programme and as an ambassador for the Red Cross Children’s Hospital. It is not surprising that Greg’s life motto is “ Never, Ever give up”. It is a commitment that he undertakes with all his heart and a lesson I continue to learn.